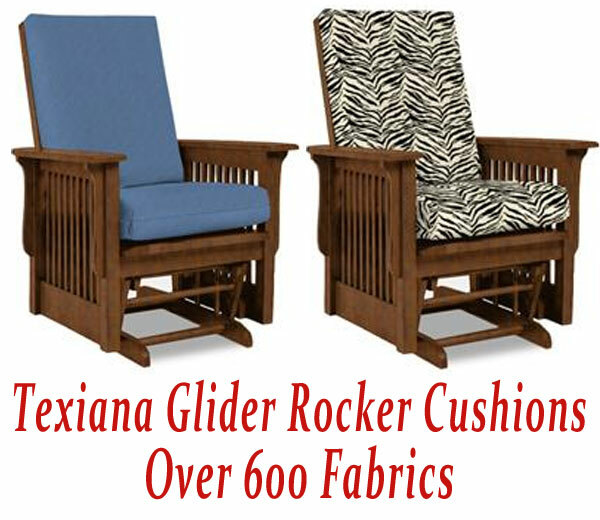 This glider rocker cushion set is a replacement set for the Best Brand Texiana Glider Rocker Chair #C8117. If your glider rocker looks like the chair we have pictured but is not a Best brand chair exactly as above, or you are not sure of the brand do not purchase this cushion set as it may not fit. If you have a Best brand chair, turn the chair up side down and a paper tag should be visible at the bottom of the seat detailing the brand of chair and item number. Please order the correct cushion set. Seat Cushion 20.75" wide x 21" deep x 4.5" thick. They fit our chair perfectly. We like the color and fabric. Well satisfied. After years of searching for someone to custom make cushions for my Mission glider rocker I found this place online. I couldn't be happier with the quality of materials, crafting, price and customer service. Perfect! An all-around A plus! Your sewers exceeded my expectations. I just received my order of custom glider cushions. Your sewers exceeded my expectations. Thank you so much!